Bethany Training on National TV! Recently, I was fortunate enough to be featured on an episode of Save Our Shelter. It is on the CW on Saturday mornings and if it isn't in a new episode, it still runs reruns and you might catch me! This is a clip of my training tips! In the first year after rescuing our dog, Brezel, my husband and I were dedicated to training her. Ideally, we wanted an obedient dog that would listen and adhere to basic commands around the house. When we rescued her, she was calm, timid, and did not show any signs of aggression. We immediately began taking her to group classes, which focused on controlling your dog in public. We went to our second group class 3 weeks after we rescued her, and a different side of Brezel came out. Anytime she saw a dog leash react, she reacted by lunging, pulling on her chain, and making aggressive sounds. We loved our dog and wanted to provide her training and support so she would not exhibit these behaviors. Click here to read the rest of this awesome blog by LaLaScoop on her fear aggressive shepherd. The video above was taken just after I had adopted my German Shepherd Charlie and I was starting to volunteer regularly at the German Shepherd Rescue in Burbank, CA. I had to bathe this scaly, stinky dog (SID) regularly and he was so sick that normal food made him ill. After an amazing journey he found a home. Now I evaluate dogs at the shelters for the rescue and work with adopters one on one with training. Click here to read full story in the Los Angeles Times, with pictures. This video was taken when I worked at Pet Orphans teaching obedience classes. They used my German Shepherd Charlie to star in the new ad campaign for their rescue. He had no training when it comes to camera cue's, but as you can see he did wonderful. He is a star! This trailer is from a short film I was involved in and our German Shepherd Charlie stole the film. If it wasn't for his big, sweet heart, the film wouldn't be near as heartfelt. Such a blessing to have such a wise rescue dog. The short film will be made public in 2017. Sick, Abandoned Dog is Rescued by Many. Who would want a scabby, stinky german shepherd abandoned by his owner? A string of animal rescuers refused to give up! July 12, 2012, 8:32 p.m. The German shepherd was lashed to a fence inside an abandoned junkyard. With no food and water, he began drinking his own urine. Part of his right ear was torn or bitten off. A too-small collar was embedded into his skin. Lesions and scabs dotted his back where there should have been fur. When an unidentified good Samaritan brought the dog through the front door of the Emergency Pet Clinic of San Gabriel Valley last winter, a stench filled the room. Dr. Jeffrey Patlogar took one look and thought the animal needed to be euthanized, immediately, to end its suffering. But almost as quickly, the vet noticed something else. The dog showed no sign of aggression. Perhaps that’s why he had been abandoned, Patlogar surmised. Maybe the shepherd wasn’t enough of a fighter, or a defender. There was something else. Kohl-black fur rimmed the dog’s eyes and trailed off at the edges, making him look even sadder, more pitiful. The veterinarian crouched down. “You look awful,” he told the shepherd. The dog replied with a lick. Judging by the condition of his teeth and gray muzzle, he looked to be 7 or 8 years old. He weighed 53 pounds, about half of what he should have weighed based on his sizable paws and frame. Even if the dog survived, it would take months to nurse him back to health. It would take thousands of dollars. Patlogar pulled out his iPhone, snapped a few pictures and texted them to his wife: “Can you believe this?” The shepherd looked remarkably like the vet’s own dog, Bear, who had recently succumbed to old age. Patlogar made an impulse decision. The shepherd could stay, for now. But no sooner did Patlogar find a large-enough kennel inside the El Monte practice than he began to second-guess himself. Was he saving the shepherd? Or prolonging its suffering? “Realistically, what is going to happen to this guy?” Patlogar wondered. Each year in the U.S., about 4 million dogs are taken in by public and private shelters. Some are lost. Most are abandoned or strays. Roughly half will make it out alive. Dogs with tags, or owners looking for them, usually get to go home. Almost as lucky are the dogs taken in by private shelters, where volunteers work tirelessly to find “forever” homes. But scarce resources force the nation’s public shelters to often make painful decisions. Younger, prettier and healthier dogs are the ones most likely to be kept alive for adoption. That’s why Patlogar and his staff hadn’t seriously considered taking the shepherd to county- or city-run shelters, which euthanized a total of more than 29,000 dogs last year. But by early summer, the clinic staff had reached a crossroads. The shepherd had been nicknamed Sid, for “skinny itchy dog.” It was a suitable moniker. Chronic skin ailments inflamed his back and legs and contributed to his yeasty, acrid odor and ceaseless scratching. An abscessed tooth was eating its way through his right cheek, which would require dental surgery, and blood tests detected a thyroid condition. The staff had tried to find Sid a home through friends, family, Facebook. They had been caring for him for more than three months and cost was becoming an issue. In one last-ditch effort, the clinic staff turned to Ric Browde, a retired Beverly Hills record producer and client. The walls of Browde’s home are lined with evidence of a career working with the likes of Joan Jett, Poison and Ted Nugent. Most days, though, he is 25 miles away at the county-run Baldwin Park Animal Care Center, serving a community where strays are a rampant problem. Just one healthy female can give birth to a litter of four to six puppies a year. Continue the multiplication — females in those litters giving birth year after year — and it’s clear why the nation has a stubborn problem with unwanted dogs, even though the vast majority of American pets are fixed. Known for his unorthodox approach to finding homes, Browde once boarded kennels on a private jet headed to France, where small fashionable dogs such as Chihuahuas are in high demand. As Browde knelt down to meet Sid, it was clear why the dog was still homeless. “Who is going to want a dog that looks like this?” he thought. Browde began working the phones. The best trait this dog had going for him, other than his gentle nature, was his breed. Browde called and emailed pictures of Sid to rescue groups throughout Southern California. Only one called him back. Caroline Pespisa, a financial analyst for Southern California Edison, was “scouting” for German Shepherd Rescue in Burbank, helping to identify shepherds that could be plucked from public shelters before they were destroyed. On June 19 last year, she drove to El Monte to meet Sid. “It’s all about appearances, and he did not look good,” Pespisa said. She felt the weight of her decision. It was either the rescue or a public shelter and almost certain death. She recommended that the Burbank organization make room, playing up Sid’s sweet spirit and playing down his many health problems. Two weeks later, Pespisa returned to pick up Sid for the drive to Burbank, a blanket stretched across the back seat. The staff of the emergency hospital gathered to see him off. “I wondered whether we’d ever find out what happened to him,” Patlogar said. At the Burbank rescue, everyone is a volunteer. The shelter relies on donations and adoption fees. Lead volunteer Jeremy Evans, a cinematographer and photographer, needs lots of young, healthy, pretty shepherds that will be adopted in a few days to help cover the costs of keeping older dogs that can take months, if not years, to find a home. Evans lies awake in bed at night sometimes, haunted by the dogs he turns away. Actress and dog trainer Bethany Wilson spends most weekends at the Burbank shelter with her husband, Chris, a screenwriter. They volunteer during Saturday and Sunday adoption hours. They walk dogs up and down North Moss Street, which runs past the shelter’s front door, in a largely industrial area and bring them outside to meet prospective owners. Whenever she can, Wilson also throws in quick bursts of basic training. First impressions are everything when someone shows up looking to adopt, but dogs that have spent months in a shelter can forget their manners. Some are so excited by the attention that they can scare a family away with all that wiggling, wagging and, worst of all, jumping. Others, like Sid, lose their ability to make eye contact. They come off as unfriendly. Oddly enough, Sid never lacked for visitors. Nearly every weekend, Wilson retrieved Sid from his kennel run to meet a visitor lured there by a write-up on the rescue website that detailed his abandonment and good nature. But Sid had two strikes against him. The first was delicate. He had not been fixed when he was a puppy, perhaps in the hopes that it would help make him a more aggressive watchdog. He was neutered at the El Monte vet’s office. But removing his testicles left behind a hanging flap of skin. Men, especially, seemed turned off by it. Then there was that chronic skin infection, which left his lower back and haunches hairless and enveloped him in an invisible cloud of stink. On Sept. 10, Wilson brought Sid out to meet yet one more visitor. He refused to make eye contact. He ignored a dog biscuit waved beneath his gray muzzle. The visitor with the biscuit was me. One day earlier, my husband and I had lost Biggie, our 13-year-old shepherd mix, to a tumor. We decided we’d adopt a dog no one else wanted and spoil him rotten, in tribute to Biggie. Now sitting before me was the canine equivalent of a Charlie Brown Christmas tree. Shy and smelly, he was perfect. A few days later, he was in our back seat for the drive home. In the months that followed, Sid was introduced to luxuries like a treat jar, dog beds and long daily walks. He soon tipped the scales at 133 pounds. His fur grew in thick and glossy thanks to a daily cocktail of supplements and medications. His skin condition is vastly improved, but will probably never be cured. He is still a tad stinky. It wasn’t long before I began to wonder about his rescuers. I wanted to thank them, of course. But I also wanted to know: Why were they moved to save a long shot like Sid? Sid came with a few pages of documentation containing the little that was known about his medical history. A neutering certificate led to the El Monte clinic. Phone calls helped piece together Sid’s journey. In addition to Patlogar, Browde, Pespisa, Evans and Wilson, dozens of others had helped in ways big and small. Saving a dog can be like rereading the same mystery novel over and over — only the final chapter is always missing. Animal rescuers rarely, if ever, know the fate of the dogs they temporarily save. That “not knowing” can eat at them. Several of Sid’s rescuers began to quietly sob when they learned he had made it and had a new name: Rambo. They delighted in details about his everyday life, asking questions about whether he got table scraps, barked at the mailman or had a favorite place to sleep. Several want to visit him. They asked for photos to hang over their desks and in their offices. Nearly all animal rescuers treasure such rare mementos, fuel for the blind faith that keeps them going in the face of daunting odds. Mostly, though, they just wanted to hear the news I was happy to give them. At last, Rambo had found his forever home. Today we’d like to introduce you to Bethany Wilson. I started riding horses and training dogs as a little kid on a farm in Southern Illinois. I always wanted to travel and my first stop was NYC since I love theatre…watching it or acting in it. 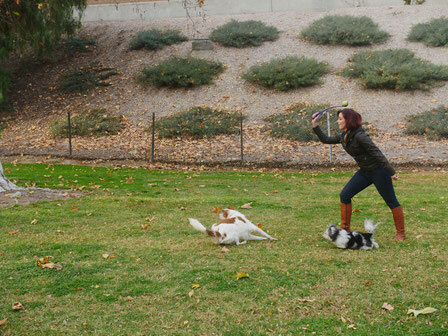 I thought I might do dog training for movies at one point, but quickly found I had a knack for behavioral training. I followed my now husband to Los Angeles and got myself a little dog that needed a lot of help. Her name is Happy, she is now 10 years old and she is what really started me on my path that led to the type of rehabilitation training I do now. I work with any age, breed, or problem and pride myself on being as thorough and honest with owners as I can be. Most of the dogs I see now have a bite history towards other dogs, people or both. I feel fortunate to be able to work with families and give the people a better quality of life with their dog. Being an entrepreneur is never a smooth road. If it is then you’re probably not working hard enough 🙂 But seriously, when you are starting a business in a new place the work is tremendous, and when you are successful or growing it continues to be tremendous. I spent a couple of years doing multiple jobs, staying up nights to figure out the online world of websites and Facebook by myself. I have no training in those matters, no training in business or even any contacts in L.A. when I started. Every mistake made I have owned and learned from along the way. When you are starting from scratch, no money, no contacts, no business experience, you have to make up for it by doing everything yourself and working 10x as hard. As a result, I believe, I currently struggle with giving up authority over matters because I spent years managing it myself. It is very difficult, haha, but worth it to let go a little and focus on having my goals evolve. My paycheck and my purpose is solely reliant on me and how much I put into it. That is a philosophy I can stand behind.